GM Chairman and CEO Mary Barra announces investment as plant celebrates new Cadillac XT6. Since 2010, GM has invested more than $2 billion at the Spring Hill Complex. 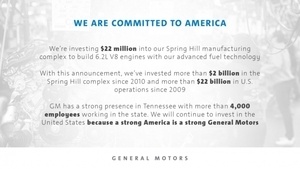 SPRING HILL, Tenn., Feb. 01 /CSRwire/ - General Motors is investing $22 million at its Spring Hill, Tennessee, manufacturing complex to enable the engine plant to build 6.2L V-8 engines with GM’s advanced Dynamic Fuel Management technology. With this announcement, GM has invested more than $2 billion in the Tennessee complex since 2010. For several years, General Motors has been transforming its business to win in the core automotive business and the future of personal mobility. The new investment is a testament to the company’s commitment to optimize its core business to meet strong customer demand. GM’s Dynamic Fuel Management technology is the industry’s first cylinder deactivation technology, which enables the engines to operate in 17 different cylinder patterns to optimize performance. DFM enables only the cylinders needed to deliver the power a customer wants. In addition to the new investment, GM is completing a previously announced $300 million investment at the complex for production of the all-new Cadillac XT6. Spring Hill will be adding more than 200 jobs for the all-new, three-row Cadillac crossover. GM’s Spring Hill Manufacturing complex consists of a flexible vehicle assembly plant and an engine plant. On the vehicle side, the plant produces the GMC Acadia, Holden Acadia and Cadillac XT5. In addition, Cadillac just unveiled the all-new Cadillac XT6 and the plant will begin building the vehicle later this year. The engine plant builds four- and eight-cylinder engines. The Spring Hill complex opened in 1990 and currently employs about 3,800 people. GM has a strong presence in Tennessee with more than 4,000 employees working in the state. In addition to the Spring Hill complex, GM has a parts distribution center in Memphis. Tennessee is home to more than 200 suppliers and GM spends more than $700 million annually with those suppliers. GM currently has 78 independently owned dealerships across the state that employ about 4,800 people. Nearly 11,000 GM retirees currently call Tennessee home.